Lewis Hamilton has a 5 place grid penalty for the Chinese Grand Prix this weekend, due to having to change his gearbox. Harsh, but that's the rule. He's been on pole for the first two races this season so has a good chance of making it three, if it weren't for the penalty. My question is, when was the last time that the fastest qualifier didn't start on pole, due to a penalty or some other situation? I don't think it's ever happened before due to a penalty but am not sure, hence the question. When was the last time the pole-sitter didn't start the race on pole? This has definitely happened due to mechanical problems or spinning off the track on the formation lap in the wet, San Marino springs to mind but I can't remember the year or who it was. There is a reason for the question - the Fantasy F1 game I run gives the pole-sitter bonus points but I am not sure what to do in this kind of situation! I was so interested in this myself that I wasn't going to stop at anything to get a good answer. Sadly, small research didn't get me the answers I was after so eventually I spent 14 hours reviewing the reports of every Grand Prix since 1950. To the date of this answer there have been 864 of them, which is why it took so long. Jack McGrath set the fastest qualifying speed but actually started in grid position 3, on the outside of the track. Jerry Hoyt started in pole as he was one of only two drivers to complete a qualifying event on "Pole Day" due to strong winds and the threat of heavy rain. Hoyt was actually only the eighth fastest in the field and his speed (140.045mph) is the record slowest ranked pole speed. This was the first GP to follow the deaths of Ayrton Senna and Roland Ratzenberger at the season's previous Grand Prix at San Marino. 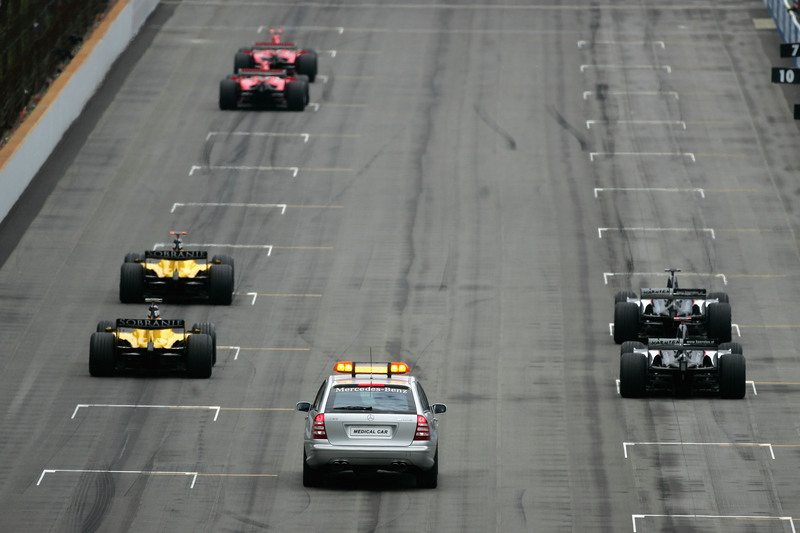 Whilst Michael Schumacher did start at pole position and is officially documented as such, grid places 1 and 2 were left unoccupied and painted with the flags of Senna and Ratzenberger's respective nations as a mark of respect. Michael Schumacher qualified with the fastest lap, earning him pole position for this race. However, Schumacher's engine failed during the formation lap at Magny Cours and did not take his place on the grid. Schumacher was involved again here, this time stalling from his hard-earned (one tenth of a second faster) pole position. As a result of this he was sent to the back of the grid. The race started successfully on this, the third, attempt after Jarno Trulli had stalled his car on the first attempt. David Coulthard was sitting happily in pole position but his McLaren failed to pull away for the formation lap. His team managed to get him moving eventually but by this time he was resigned to starting from the back of the grid. This is the one they called "IndyGate". Jarno Trulli was fastest qualifier and therefore in pole position. However, due to safety concerns regarding the Michelin tyres, all drivers of vehicles with these tyres retired to the pits during the formation lap. Only six cars started the race with drivers in grid places 5, 7, 17, 19, 18 & 20. Kimi Räikkönen qualified with the fastest time but was given a 10-place grid penalty for changing his engine. Juan Pablo Montoya took up pole position as a result. Fernando Alonso recorded the fastest time in qualifying but a stewards' inquiry before the race adjudged Alonso to have impeded Lewis Hamilton during Q3. Alonso was subsequently relegated 5 places on the starting grid, moving Hamilton up to pole. In this event, Lewis Hamilton was excluded from the qualifying results due to having insufficient fuel to return to the pits. As a result, Hamilton had to start the race from the very back of the grid. The fastest qualifier at Monaco was Michael Schumacher. However, Schumacher was carrying a 5-grid penalty from the previous race in Spain for causing an avoidable collision with Bruno Senna, thus moving him back in the grid. Ayrton Senna had secured pole position but was unhappy that pole was situated on the side of the track which was not on the racing line. Senna requested that he be moved and the stewards agreed, only for the FISA president to overrule the decision, meaning Senna started in pole at the original location. There is a reason for the question as the Fantasy F1 game I run gives the pole-sitter bonus points but I am not sure what to do in this kind of situation! You'll have to decide! Perhaps give the bonus for fastest qualifier instead of pole position? You can see my spreadsheet with all the pole positions since 1950 here.